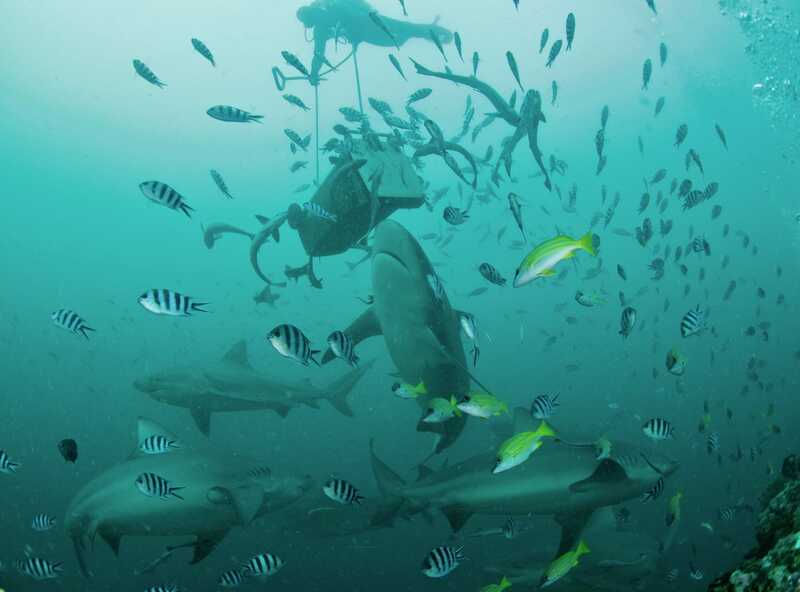 Murky waters are not what usually come to mind when thinking about diving in Fiji. Unfortunately, we had timed our visit straight after the typhoon in mid-April. Having reached Viti Levu after several days delay, it was only to find that conditions were still too bad on the south coast to do any diving for a couple of days; so we contented ourselves to enjoy the beautiful island and the locals’ fantastic hospitality. One of the dives we were most looking forward to was the famous Beqa Lagoon shark dive at the Shark Reef Marine Reserve. Being very keen on shark conservation I was interested to see how this operation worked, how it involved local people in the marine reserve and how the proceeds from tourism helped with maintaining a protected area for sharks. Luckily for us the weather settled down after a few days and we were able to book in for a shark dive! We chose to go with Beqa Adventure Divers and booked to do two shark dives in the morning and an afternoon soft coral dive. We were greeted on arrival by a friendly and efficient front desk team and completed all the necessary paperwork. We then went through to the gear rental and equipment set-up area to get ready to dive. Here we had our only negative experience of the trip, bumping into an extremely rude man, who turned out to be one of the owners! Thankfully our interaction was a brief one and as the rest of the staff possessed the manners and professionalism sadly lacking in their boss, we moved on and did not allow this incident to ruin our whole day. Once kitted up, our equipment was loaded onto the boat and we met our crew. The boat briefing was very good and the dive briefing thorough, with clear and precise instructions given as to where to go, when, who to follow and how to behave. The divemaster gave us strict instructions on keeping all limbs and cameras to yourself and behind the purpose built walls. The dive plan was well thought out and explained, with the aid of a dive site map. At the site we were told the visibility was likely to be lower than pictures we may have seen and to stay close to the divemaster assigned to you. We were also given a quick shark ID summary and requested to count the sharks we saw by our boat’s marine biologist. With growing excitement we kitted up and jumped in! Once in the water we descended with our DM and took up position in front of ‘The Arena’, behind a wall built of coral rubble at 30m. Once all the divers were positioned with DMs at either end and at various points behind us with big poles, the feed began! Another DM swam above us with a wheelie bin full of tuna heads, controlling the position and timing of the dropped food so that as the Bull sharks came in they would chomp up the fish just in front and above our heads, giving a magnificent view of these huge sharks in feeding mode. For 15 minutes huge Bull sharks swam all around us, feeding and cruising past, eyeballing the group. The experience was made all the more atmospheric by the low visibility – dark shadows emerging into oncoming sharks in what felt like the last few metres! After 15mins at depth we moved up to the next level, 10m for an another 15 minutes, to view Grey, Whitetip and Blacktip Reef sharks, which were fed fish from a smaller container by a DM. The final part of the dive was really an extended safety stop at 5m, with around 10mins to enjoy the reef sharks and abundant fish life at the top of the reef before surfacing. With everyone buzzing about the dive we were served hot drinks and cookies on the boat, while the marine biologist took data from us, about what sharks we had seen and how many we estimated there were of each species. Apparently today was a quiet day with ‘only’ 20+ Bull sharks (they can get up to 70+ on a busy day!). He then gave us a talk on the shark species we had seen, their behaviours, and some great information about the formation of the marine reserve and their continuing projects and data collection. After a lengthy surface interval to off-gas, we headed back in at ‘The Take Out’ to do a 15m dive for 30mins and 5m for 10mins. Here we lay on slabs of rock behind a small wall and had some even closer Bull shark action. The DM behind me occasionally had to bop a shark on the snout if it continued towards us a bit too close, but the sharks seemed very used to the routine and interested only in having a snack of tuna head. The visibility was worse on this dive, adding to the drama, but also making we wish we could experience it again in clear water. After half an hour, which seemed like only minutes with all the stunning sharky action, we headed up to safety stop depth and once again enjoyed the Reef shark feeding. I didn’t know how I would feel about the shark dive going in, but was prepared to give it a go and I knew I would love seeing sharks in close proximity. Having done the two dive morning, I am very impressed with the set up at B.A.D. Safety wise it is excellent as the very structured dive plan contributes to the high level of control the staff have at all times. 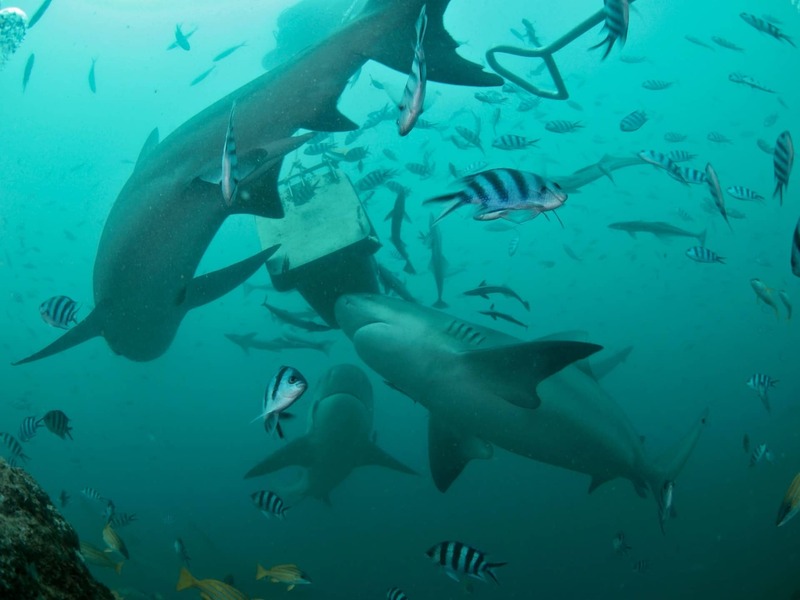 The feeding was organised to allow everyone to get a good view and close up action with the sharks, and the high ratio of DMs to divers means the staff have total control of the group and the ability to turn away any shark that gets a little too curious without any drama. 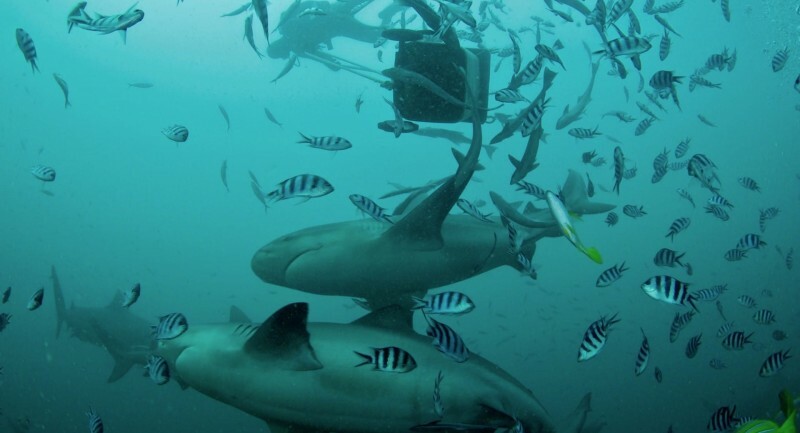 Having a multi-level dive also allows divers to see several different species of shark on one dive and extend the dive time. The staff on the boats and in the water were all locals, all of whom were knowledgable, professional and exuded a calm on a boat full of very excited tourists. I was really impressed that they had a marine biologist on each boat to provide info, take data and answer questions. Also we were told that a portion of the money from tourism goes to local communities that have given up their fishing rights in order to create and maintain the marine reserve, which is great news and a good conservation strategy. Sadly as the weather was worsening and the vis deteriorating, the afternoon dive was called off and so we packed our things and headed off for a good lunch, all that excitement certainly works up an appetite! 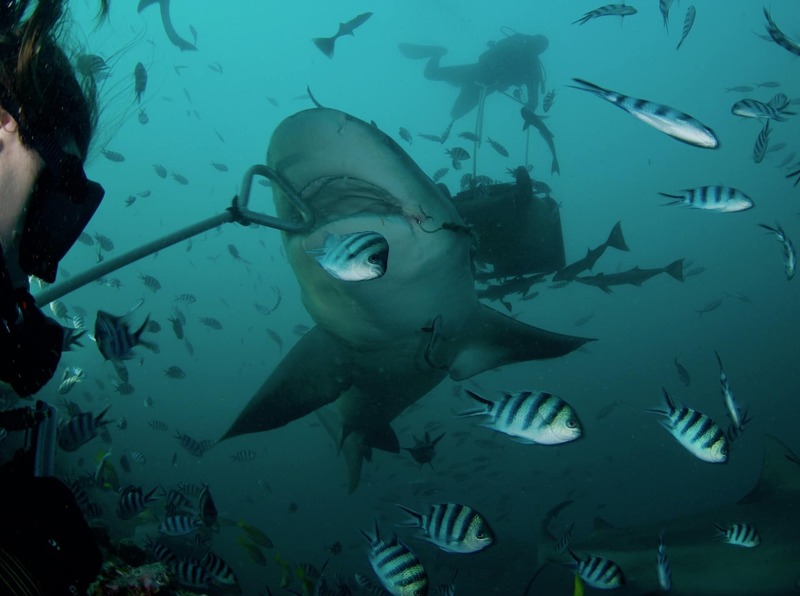 On the whole, we had a really good experience with the Fiji Shark Dive in Beqa Lagoon and would recommend it to anyone who wants to see Bull sharks up close. However if you want to do lots of diving and see some of Fiji’s other world class dive sites in all their glory, I would recommend paying high season rates and travelling to Fiji outside of the typhoon season!